30 Jun Greek Cheeses anyone? Award-winning Greek cheeses, with their unique taste, explain why in Greece the annual per capita consumption is higher than in any other European country. Soft, creamy and hard, white and yellow, fresh and mature, salty and sweet, each one a nobility, all produced with mastery and skill. Cook them, mix them, grate and sprinkle them, wine-tie them, fry them, stuff them, adore them…Follow us in a tour to each region that has developed its own special varieties of cheese. 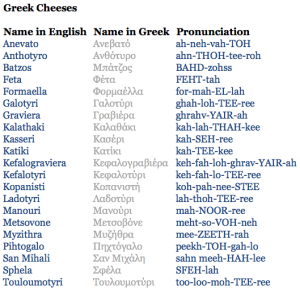 Let’s take a tour in the Aegean, specifically in the Northeastern Aegean, where cheeses vary. Manoura from Sifnos is aged in wine dregs; Kalathaki from Limnos, a lovely basket-shaped, goat’s milk white brine cheese, akin to feta, takes its name from the basket (=kalathaki) that is used to produce it. Now let’s move a little towards the Cyclades, to meet the Cyclades cheeses. . San Mihalis in Syros island, also a PDO cheese? Manoura of Sifnos’, with a pinkish hue and dark, winy aroma? Chloro from Santorini, to be eaten either fresh (and soft), or aged over pasta? You just name it! If you find yourself in Crete, the Cretan cheeses you will find that are part of the wellness and long-life ratio causes of the islanders. All Cretan cheeses are made from either sheep’s or goat’s milk or a combination of both. Here’s a short list: Graviera, perhaps the most famous of Crete’s cheeses, ranges from sweet, when young, to nutty and resonant, when aged. Kefalograviera, harder and more piquant than graviera, is a table cheese that is often also used in baked dishes like pastitsio and moussaka. Myzithra, a fresh whey cheese, relatively low in fat, and similar to ricotta. Staka, a cholesterol-rich delicacy only found in western Crete, which is prepared from the cream skimmed off the top of sheep’s milk. The gorgeous Graviera cheese is by now a tradition. It is made as far north as Macedonia and as far south as Crete, in Corfu to the west, in Mytilini to the east, and just about everywhere in between. In Epirus, you will find Feta, of course – the shepherd’s cheese par excellence. Dodoni, the district around the ancient oracle and amphitheater, produces some of the country’s best. You will also find Galotyri, literally ‘milk cheese,’ irresistibly creamy and tangy, but hard to find outside the shepherds’ strongholds of Epirus, Thessaly and Roumeli. Hard, pungent Kefalotyri is made from goat and sheep milk, and is mainly used for grating. Sweet Manouri, a smooth whey cheese made from sheep’s milk or a mixture of sheep’s and goat’s milk to which cream has been added, comes in long, pure white cylinders. Delicious with fruit or on its own for dessert. 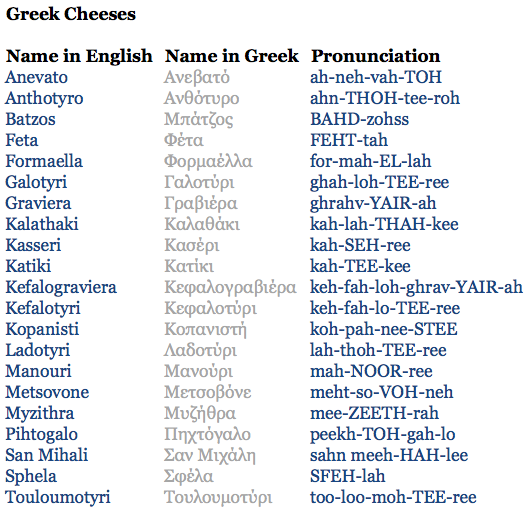 And, of course, last but not least, Feta: Greece’s cheese for all seasons. In Greece the cheese course runs parallel to the meal. Feta, the national Greek cheese, is relentlessly nibbled at, be it with a winter salad of boiled bitter greens, or a main course of summer vegetables stewed in olive oil, or a midnight snack hand-in-hand with a slice of crisp, icy, sweet watermelon. As for the unusual storing of Feta, there is a perfectly logical explanation: Feta is a rindless wet cheese. 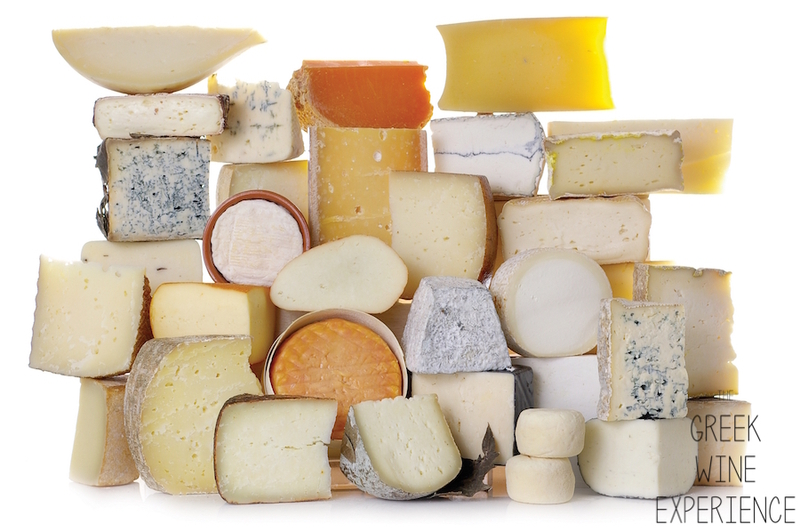 It is aged and cured in brine, and will keep all its flavors if it remains submerged.Greeks (together with the cheese obsessed French) have the highest per capita cheese consumption in Europe. 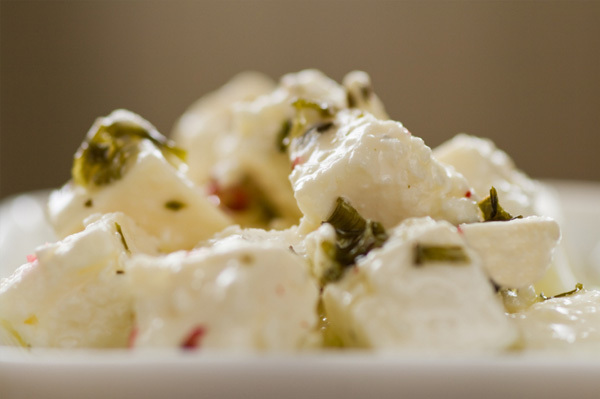 Feta is the quintessential Greek table cheese, but it is also excellent in all sorts of other dishes. As a main ingredient, it finds its way into savory pies, made with Feta and eggs, or combinations of cheeses, or mixtures of greens and cheese. It is also a staple on the meze table, and can be grilled or baked in paper and even sautéed, sometimes with a crust of nuts or sesame seeds or a simple egg and flour wash.
It’s basically more of a meal in itself.